A spider is silhouetted while hanging from its web. Often feared and reviled in the Western world, spiders in other cultures are seen as wise and industrious. Science is slowly revealing the secrets of their remarkable silk. Spider silk is ideally adapted to capture flying insect prey. Scientists are still learning how to replicate it's dual properties of strength and stretchiness. Mention spiders, and many people shiver. But a local researcher says they are nature’s most adept architects, spinning intricate webs from amazingly elastic material. In this week’s Exploradio WKSU’s Jeff St.Clair reports on why the eight-legged arachnids deserve our respect. Why spiders deserve our respect, on this week's Exploradio. We’re in the lab of University of Akron researcher Todd Blackledge. I brought along some spiders in the hope that he can identify them. They don't pose much of a challenge. “All right," says Blackledge, "you have three beautiful little spiders there," he says with the same warmth as if I had presented a box of kittens. "We’ve got what we sometimes call a daddy-long-leg spider," dubbed the spindly-legged spider by my family. There’s also a small, shiny, brownish one, “the common house spider, " says Blackledge, known for its habit of leaving cobwebs in hard to reach places. And there’s one more, a wolf spider, which unlike the other two was found outside of my house. Spider researcher Todd Blackledge 'wrangles' a black widow spider out of its cardboard cave in his lab at the University of Akron. Black widow spiders, despite their sinister reputation, are the workhorse of spider research due to their docile nature. Blackledge isn’t at all squeamish as the spindly-legged spider crawls over his hand. It suddenly dives in a spider free-fall. The attempted escape is a chance for Blackledge to talk about his favorite topic, spider silk. “It’s the ultimate in green chemistry for high-performance fibers," he says. And for Blackledge, that’s the real magic of spiders. Their silk. 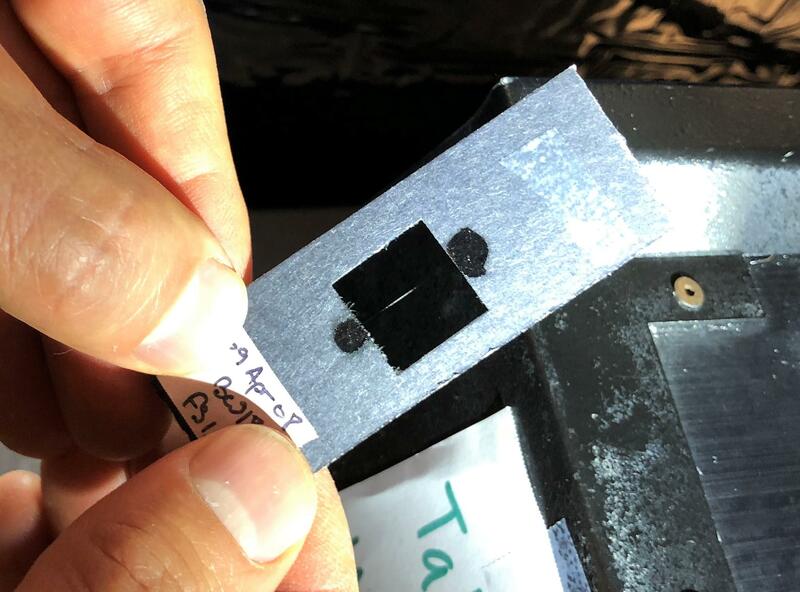 A tiny section of spider silk is barely visible in a cardboard slide holder. Todd Blackledge tests the 2 micron thick strand for its tensile strength, about half that of a similar diameter strand of steel. Ounce for ounce, though, spider silk is five times stronger. Basically it tells him how strong the silk is. “It’s about 2 microns thick,” he says, "around 100 times thinner than a human hair." The thread holds for a surprisingly long time. “Wait for it,” he says, right before it snaps. Spider silk the thickness of a pencil could theoretically stop a jet plane. Blackledge is one of the first to study the silk of a newly discovered spider from Madagascar – Darwin’s bark spider - which not only builds the largest webs in the world, it produces the strongest silk. Todd Blackledge is among a team of scientists studying the remarkable webs of the newly discovered Darwin's bark spider. 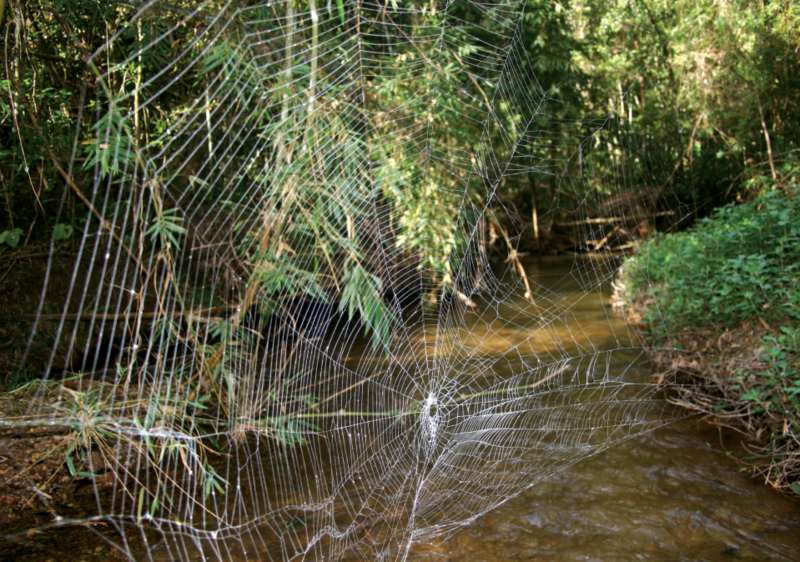 The web fibers of this species are twice as strong as other spiders' silk, allowing them to span large distances, even crossing rivers. Blackledge is also working with spider glue, the chemicals that make webs sticky. His discoveries are leading to adhesives that could be used in produce packaging and even bandages. Commercial production of spider silk still eludes us, but Blackledge says, we’re close. But he says the synthetic spider silk is still only half as strong as the real thing. Blackledge’s lab is home to dozens of black widow spiders, which is the spider of choice for researchers due to its mild temperament and ease of care. He teases one out of its cardboard cave to give me a closer look. It's similar in shape to the common house spider, a distant relative, but much larger. I can see the tell-tale red hourglass on her abdomen. 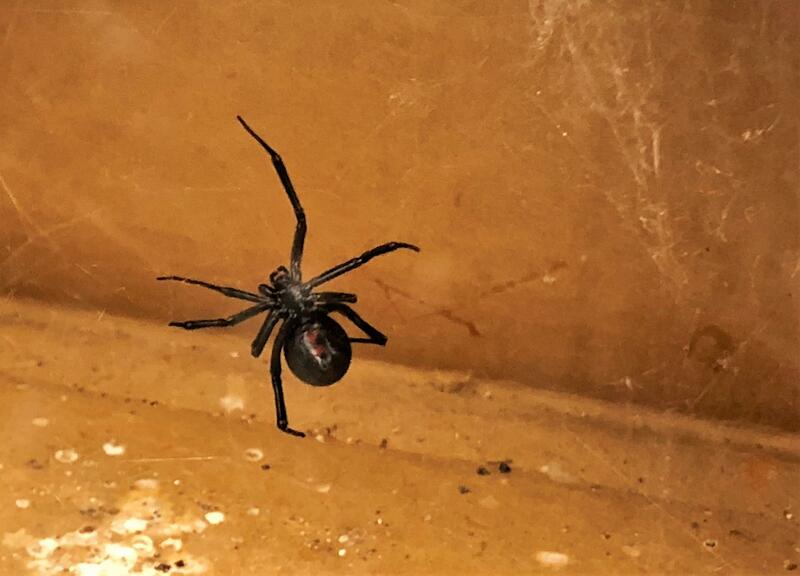 The black widow is native to Ohio, but is extremely uncommon. It's identified by the red hourglass shape on the underside of its abdomen. He says while rare, black widows do live around here, although he's never seen one in the wild in Ohio. The ones in his lab are imported from California, where they're disturbingly common. Only a handful of the more than 46,000 spider species in the world are, like the black widow, hazardous to humans. Blackledge feels our fear of them is wildly overblown. Science has shown that even if we don’t love spiders, they deserve our admiration. A major effort is underway to brand Cleveland as a national tech hub. Blockland is the brainchild of a Cleveland luxury car dealer who’s put together an A-team of backers of blockchain technology. But what is blockchain and what can it do? In this week’s Exploradio, WKSU’s Jeff St.Clair looks at the challenges of making Cleveland a tech Mecca. Patricia Princehouse, director of the evolutionary biology program at Case Western Reserve University, wants to know how we got man’s best friend, dogs, from wolves. A team at the University of Akron has developed a new type of non-toxic pigment inspired by the vibrant colors of bird feathers. In this week’s Exploradio, WKSU’s Jeff St.Clair reports that the success came as a surprise to the researchers.